Tasks "I assigned to others"
Task "I am copied on"
By default, the tasks in My Tasks are sorted by due date, title and then priority. The tasks can also be sorted manually by any of the fields in the My Tasks view. The fields listed can be customized by any company admin using the custom task property options. To add a new task to a workspace from My Tasks, simply begin typing the task name in the "Create new task" field. Then extend the view by selecting "More options" and select a workspace from the "Create in" field. You can also create personal tasks. Personal tasks function just as workspace related tasks, but the task details can only be seen by you. Generally, personal tasks are used to keep track of your own private “To Do” list. 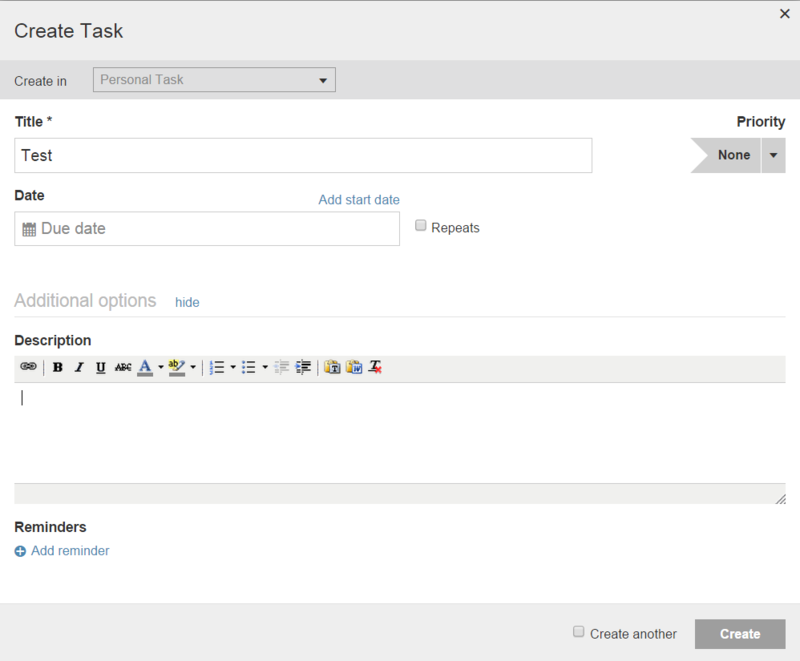 To add a Personal Task, create a new task and select personal task in the "workspace" field.